One of my favorite things about the 21 Day Vegan Soup Challenge is the bestovers (that's what I call leftovers). Personally, I could eat the same yummy thing every day. However, if you like variety it's a good idea to cook two or three pots of soup each week during the challenge. This means you're likely to have leftovers. Freezing soup is the best way to deal with leftovers. Most vegan soups will still taste fine when thawed and enjoyed after 6 months. Here are some tips for freezing soup and ideas for what to do when you have no freezer space or hate leftovers. Soups that freeze best: Bean soups, vegetable soups, broth-based soups, soups with brown rice or wild rice, and pureed soups. Don’t freeze herbs in soup. Just add them to reheated soup. Don’t freeze cooked pasta. Instead, boil fresh pasta and add this directly to the reheated soup. Slightly undercook vegetables, especially potatoes. If you're making some soup to eat now and some to freeze, scoop out/put aside the portion of soup you plan on freezing before finishing/fully cooking the soup you plan to eat. Freeze in quarts or in single portion sizes. This makes it easier to tote to work, store in the freezer, and reheat. Cool. Cool soup before putting it in the fridge or freezer. Remove the lid and take off the stovetop. Stir soup often to help release the heat. You can speed up the cooling process by placing the pot of soup in a bath of ice water in the sink. Package. Label and date quart-size zip-top plastic freezer bags, place in a bowl, and cuff the bag over the edge. Ladle soup into each bag, then let out any excess air and seal. To avoid using plastic, ladle into wide mouth mason jars. Leave 1”- 2” of space to give soup room to expand when it freezes. Otherwise the jar will break. Freeze. Lay bags flat in a single layer in the freezer; when frozen, stack bags to save space. Stack jars in freezer. Thaw overnight in fridge. Put a dish towel or bowl under the soup as it thaws. No Freezer Space? Low Tolerance for Leftovers? No Problem. Find a soup sister (or brother). Cook and share soup on alternating weeks. Organize a soup swap with your neighbors. The more swappers, the more variety. Stick some soup in the freezer at work. Have it for a healthy lunch on days when you forget to pack one! Host a potluck. You provide the soup. Have guests bring over dishes that go well with soup or just ingredients for the salad. How do you feel about leftovers? Love 'em or hate 'em? 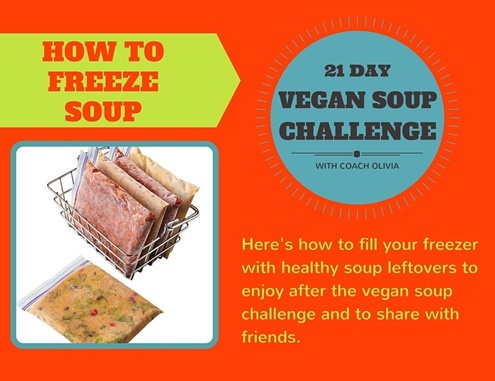 Are you participating in the 21 Day Vegan Soup Challenge this February? Register and info here.